Ellis Rogers is an ordinary man who is about to embark on an extraordinary journey. All his life he has played it safe and done the right thing, but when faced with a terminal illness, he’s willing to take an insane gamble. He’s built a time machine in his garage, and if it works, he’ll face a world that challenges his understanding of what it means to be human, what it takes to love, and the cost of paradise. 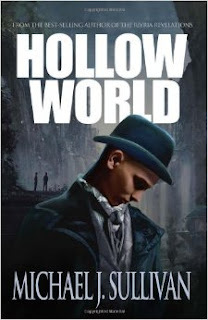 He could find more than a cure for his illness; he might find what everyone has been searching for since time began…but only if he can survive Hollow World. Welcome to the future and a new sci-fantasy thriller from the bestselling author of The Riyria Revelations. This has received a lot of hype and praise, which it largely lives up to. While not my primary genre, this is a strong science fiction book, complete with time travel 2000 years into the future and a type of hybrid human. Loaded with great pop culture references, the same consistent, solid writing that made The Crown Conspiracy and other Riyria books a pleasure to read, and great characters, science fiction fans can not complain about anything in this book. I have read quite a few science fiction books in the past and this definitely ranks in the upper echelon in terms of quality and fun. Highly recommended for science fiction fans. Also recommended if you are new to science fiction or even if you don't necessarily consider yourself a fan of the genre, still try this because in terms of story enjoyment and literary value, this is a great book!